^ "The Gaps in Our Defense", Claude Witze, Air Force magazine (March 1972), pp. 33-39.66. ^ 各国都在搞防空识别区. 新华网军事. [26 November 2013]. （原始内容存档于2013年12月8日）. ^ 详解防空识别区：最早出现于上世纪50年代. 东方网. 26 November 2013 [26 November 2013]. ^ 6.0 6.1 日本非法扩大“防空识别区”. 北京日报. 16 February 2013 [16 February 2013]. （原始内容存档于2014年1月12日）. ^ Japan extends ADIZ into Taiwan space. 台北時報(自由時報報系). 26 June 2013 [24 November 2013]. ^ Japan scrambles fighters over Diaoyu. 環球時報(人民日報報系). 24 November 2013 [24 November 2013]. 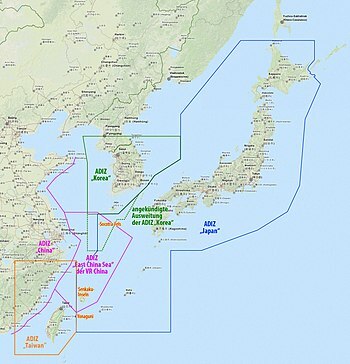 ^ JAPAN-ADIZ 日本防空识别圈- Google地图 互联网档案馆的存檔，存档日期2013-12-08. ^ 陸武力恐嚇「飛識別區要先通報」　日韓不甩、台照辦理. 東森新聞雲. 2013-11-26 [2013-11-26]. ^ 中國宣佈劃設東海防空識別區 涵蓋釣魚島. 文匯報. 2013-11-23 [2013-11-24]. ^ 東海防空識別區 法籲各方克制，中央社，2013年11月27日. [2013-12-02]. （原始内容存档于2013-12-03）.